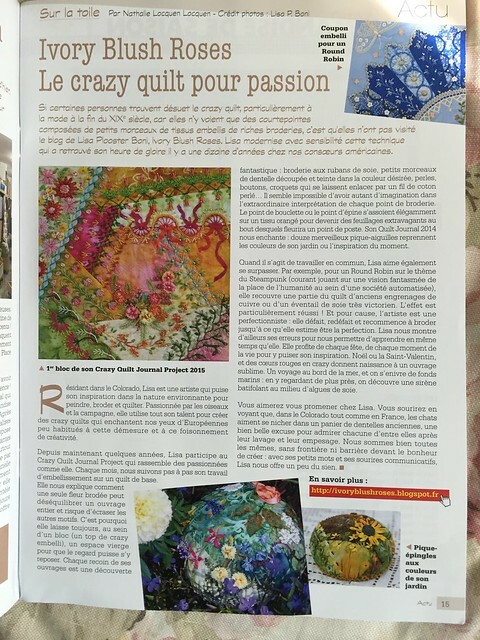 A few months ago, Nathalie contacted me about writing an article about my crazy quilting and my blog! My sister Holly, who holds several degrees, two of which are in French, kindly translated Nathalie's article for me. This is the article as submitted, and not necessarily as published, so please forgive any errors! If Crazy Quilting, this detailed form of patchwork, which knew it’s peak at the end of the 19th century, seems outdated for some, who do not see the subtle counterpoints made from small, irregular bits of fabric, luxurious and carefully decorated with rich embroidery, it’s because they have not gotten lost in Lisa’s blog, Ivory Blush Roses. Lisa has modernized this technique, which has regained its hour of glory in the past dozen years with our American sisters. Lisa Plooster Boni lives in Colorado; she is a painter, seamstress, quilter, and enthusiast of the birds and countryside where she lives; she utilizes all of her gifts, and takes inspiration from nature to create her crazy quilts which can’t help but enchant our European eyes which are not habituated to such a measure of [flights of fancy] and creativity. For several years now, she has participated in the Crazy Quilt Journal Project, and each month, we get to follow her work step by step of embellishing her base quilt block. She explains how each flower is embroidered, how it can destabilize an entire work or detract from others; she always leaves, in the heart of the block (a top mark in crazy quilting) a space for the eye to rest. Silk ribbon embroidery, pearls, buttons, little scraps of lace, dyed and tinted in the desired color, bits of crochet from a string of pearl cotton; every corner of her work is a fantastic discovery; it seems impossible that one could have enough imagination in the extraordinary interpretation of each bit of embellishment. Ball and thorn stitches come together elegantly on orange fabric to become extravagant foliage, at the ends of which flower a point of [?]. Her 2014 quilt journal enchants us with her 12 marvelous pincushions, showcasing with each month the colors of her garden, or the inspiration of the moment. Lisa equally likes to outdo herself in exchanges, by way of round robin (a creative exercise in which a defined number of participants send unembellished blocks of crazy quilt to others with the mission of embellishing one following a defined theme; the blocks then travel, to thus become a common yet unique work) such as for a Steampunk theme, with copper gears, or a very Victorian fans. Lisa shows her embellishment errors, and her rework until she finds perfection. We learn along with her, and we acquire the process of creation. Lisa takes advantage of each holiday, each moment of life to take inspiration: Christmas; St. Valentine’s, and red hearts are born in a sublime work of art; a trip to the seaside, and one gets lost in the deep sea. Look closely, and see a mermaid frolicking amongst algae made of silk. You will [like/love] following Lisa; you will learn in bursts of laughter, that even in Colorado, as in France, that old cats can revel in a basket of old lace, a great excuse to admire each one for itself, after their washing and preening. We are after all the same, without boundaries or barriers when it comes to the joy of creativity, and Lisa, with her gentle words and knowing smiles offers up a little of herself. May I simply say, "Wow?!" I am humbled and honored that my work should be written about with such eloquent words! Thank you Nathalie! Congratulations! It is wonderful to see your beautiful works published! Congratulations. 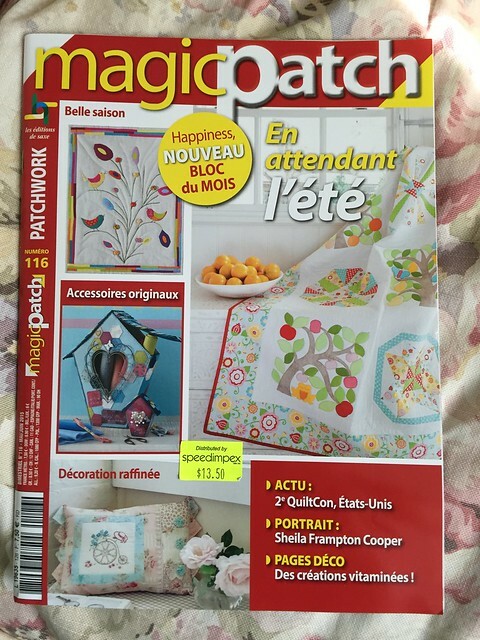 What fun to be published in French. (Didn't Professor Higgins say, "The the French don't mind what they say as long as they pronounce it properly?") They wrote lovely things here and I'm sure they sound even better in French! WOW and congratulations dear Lisa. A lovely article about you and your exquisite creative works. Congratulations Lisa. Your work is absolutely beautiful. I love looking through your blog. I still go back to old posts that I have already read and see something new I missed the first time. Thank you for sharing your talents with us. A wonderful article of which you are most deserving. I have enjoyed your blog for several years and check it daily for your posts. I find much beauty and inspiration there. Congratulations and thank you. your stitching is superb Lisa! qui suis débutante en crazy. I am Happy for you Lisa.